It was a complete performance from start to finish by the Revolution, who dominated a lackluster Toronto team in a 3-1 victory on Saturday. The game was practically over at the half when the guests went down to 10 men with the straight red given to Jozy Altidore minutes before halftime with the home side up 2-0. Bobby Shuttleworth (6): With a dominant performance from the men in front of him for most of the game, it was a good situation for him to return after a two-week layoff due to a concussion. Bid for a clean sheet disappeared in the 75th minute on a poor sequence defensively by the Revs. Jeremy Hall (6): Was active up and down the wing for the Revs. Served in couple dangerous crosses in the box and a good complement to Chris Tierney on the left side. Andrew Farrell (6.5): Great performance from him. Pretty much kept Sebastian Giovinco in check, limiting the “Atomic Ant” to just one shot in the first half. His speed and size over Giovinco definitely gave him the advantage on this night. Jose Goncalves (7): Strong performance. Frustrated Altidore all night which eventually saw him get a straight red minutes before halftime. Limiting his long ball attempts and was effective passing out the back field, which helped the Revs possession game. Chris Tierney (7): “The best left foot in the East” was selected to the Allstars game last week and he played like an All-Star on this night. Assisted on a beautiful training ground variety free kick goal. As usual, put in dangerous crosses from his left side of the pitch. Scott Caldwell (6): The Revs had a 58% possession advantage and a large part of it was due to Caldwell’s ability to distribute the ball at his defensive mid position. Daigo Kobayashi (6.5): Back-to-back strong performance from the Japanese veteran. Great through ball early in the game that resulted in a good attempt on goal from Tierney. His selfless defensive work often goes unnoticed but was all over the field tonight. Had 10 recoveries, 1 tackle and 1 interception. Unfortunately with Jermaine Jones back, Revs fans won’t see as much of him down the homestretch. Diego Fagundez (6): Another good showing from the 20 year old. 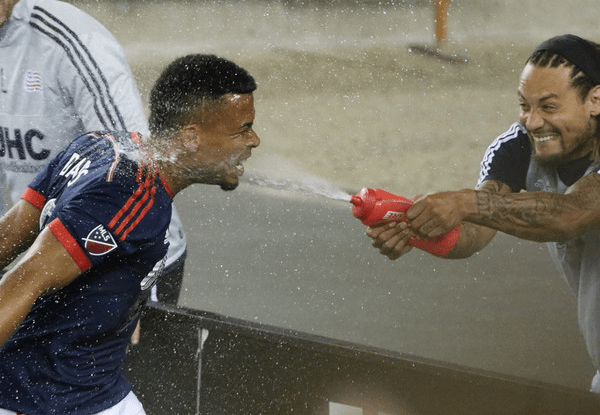 Even though he didn’t show up on the stat sheets but his ability to find space and connect with his teammates helped the Revs with the possession-oriented style that they love to play. Worked hard tracking back on defense. Kelyn Rowe (7.5): Played like a man who wants his starting job back. Played a part in all of 3 Revs goals. Credited with an assist on the first of Davies’ two goals. Worked hard on defense. Is the 2013 version of Kelyn Rowe back? Lee Nguyen (6): An uneventful night for the 2014 MLS MVP finalist. As usual, did a good job circulating balls around the pitch. Converted the PK which put the Revs up 2-0 before half. His hair style decision could use an assist, however. Charlie Davies (8): Two goals and a Man of the Match kind of performance. Made dangerous runs all night. With Altidore out of form with U.S. Men’s National Team, will he get a call from Jurgen Klinsmann? Teal Bunbury (6): Was active for his 25 minutes on the pitch. His main contribution was probably the clearance in the box late in the game using his speed tracking back to help the defense. Juan Agudelo (6): Worked hard for his 20 minutes on the pitch. Had a dangerous chance with his shot just wide across the face of the goal. Did a good job holding the ball in the final minutes. Jermaine Jones (6.5): Those long gorgeous diagonal balls that Revs fans have been waiting for are finally back. Not many in the league can hit those balls better than Jones. The long awaited return of Jermaine Jones capped off with a 65 yard full sprint from box to box put the league on notice. He’s BACK! Player rating ?? First time this season? Yep – they’re back! Hope you enjoy them. Feel free to offer your thoughts, as well! Bach Vu files Revolution player ratings for NESoccerToday.com. Follow him on Twitter at @Vudoo14.